Swinging gates are by far our most popular gate style because of its elegance, ease of installation and often reduced price when comparing similar jobs for sliding gates. These gates, as a whole, swings in one direction. They are usually a bit longer, but often the best fit for most homes based on the average length of the gate needed to fit the width of your driveway. These gates have two different gates that each swing one direction. These are often used for wide driveways when the gate would be very long as just one piece, so instead our customers opt for a gate split into two pieces. Additionally, these gates are less likely to hit guests cars, as they are better able to calculate how to stay out of its way when opening or closing. However, there are some instances where these type of gates aren't the best choice, or just blatantly can’t be installed which I have listed below. Too Little Space: Whether it be from your house to the street, the driveway is to short, or some other reason, the space available for the gate to swing can hinder us from being able to install one where you want it. The slope of the driveway or road leading up to your house is too steep: If the driveway or road has too steep of a slope, then often times we won't be able to make an appropriately sized gate that can swing without hitting anything. For these reasons, some customers would decide to go without another style of gate.. Sliding gates are slightly more expensive than swinging gates, have more of an industrial look and are really good for wide driveways or driveways with a steep incline/decline. Although these gates are the less popular option, they are still a beautiful gate that can be custom designed to your needs. These gates are most often necessary when your house has close proximity to the street, a shallow driveway or is an angle that isn't suitable for a swinging gate. You can put almost all the same design features on this gate, just the way it opens is slightly different. Ultimately, its hard to go wrong with either gate. You just have to find the one that best fits your home and your preferences. 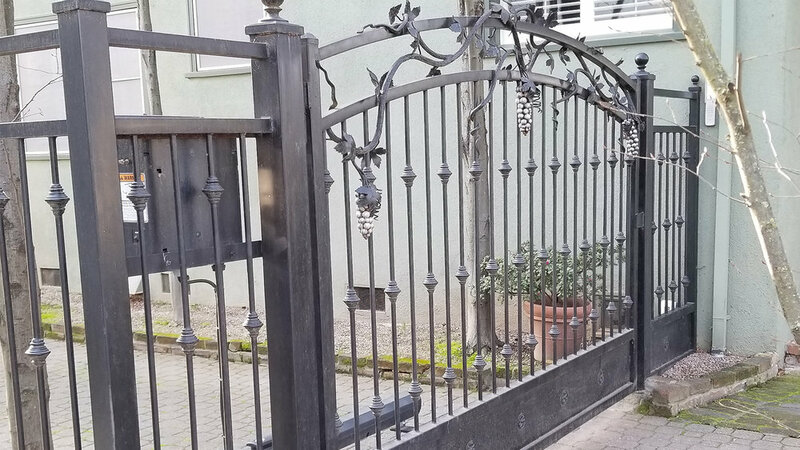 If you would like to get out professional opinion on which gate would be best for you or to get a free estimate, give me a call at (916) 620-8618.